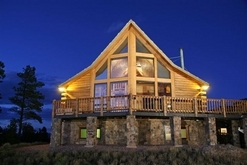 Lonesome Dove Ranch is a custom full log home accented with native Colorado moss rock on 105 acres; set up as horse property with 4 fenced pastures, a 42’x45’ Morton barn with two exterior horse stalls, shop with cement floor, hay storage, loft, workshop, dog run, water hydrants and frost-free horse waterer. 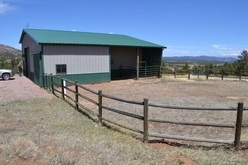 The property has gently rolling pasture ground, ponderosa, pinion, gamble oak, aspen and dramatic rock outcroppings. 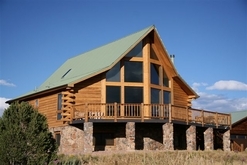 The incredible views include the majestic Sangre de Cristo Mountain range, the Collegiate Peaks, Wet Mountains and Pikes Peak. The home is on maintained subdivision roads and just minutes from Westcliffe. This comfortable, well-designed home has a total of 3612 SF on 3 levels; 3 bedrooms, bath and den are in the lower level, walk-out basement; master bedroom and bath are on the main level, along with the kitchen, great room and powder room. A family room/office/sleeping area is in the open loft. Floor-to-ceiling windows and a wood burning stove with stone surround highlight the great room. The open, eat-in kitchen has custom cabinetry, concrete countertops and a central island with wine cooler and trash compactor. The dark night skies in the Wet Mountain Valley provide spectacular star-gazing; enjoy these views from the Sundance Spa. There is an electrical ice-melt system in the surrounding concrete pad so even snowy winter evenings are no problem. The recreational opportunities include: private access to Grape Creek and Lake DeWeese for trout fishing through the property owners association’s common areas, whitewater rafting and fishing on the Arkansas River, 30 minutes away, Sangre de Cristo wilderness areas and the Rainbow Trail for hiking, climbing and backpacking, fishing in high mountain lakes, big game hunting, skiing at nearby Monarch ski area, approximately 1 hr away.